How have invasive pythons impacted Florida ecosystems? Non-native Burmese pythons have established a breeding population in South Florida and are one of the most concerning invasive species in Everglades National Park. Pythons compete with native wildlife for food, which includes mammals, birds, and other reptiles. Severe mammal declines in Everglades National Park have been linked to Burmese pythons. The most severe declines in native species have occurred in the remote southernmost regions of Everglades National Park, where pythons have been established the longest. In a 2012 study, populations of raccoons had dropped 99.3 percent, opossums 98.9 percent, and bobcats 87.5 percent since 1997. Marsh rabbits, cottontail rabbits, and foxes effectively disappeared. The mammals that have declined most significantly have been regularly found in the stomachs of Burmese Pythons removed from Everglades National Park and elsewhere in Florida. Raccoons and opossums often forage for food near the water’s edge, which is a habitat frequented by pythons in search of prey. Can Burmese Pythons swim from the Everglades to the Florida Keys? Are there invasive reptiles other than Burmese pythons in the United States that people should be concerned about? Where are Burmese pythons or other large constrictors distributed in Florida? How many Burmese pythons inhabit southern Florida? Tens of thousands of invasive Burmese pythons are estimated to be present in the Everglades. What should I do if I see a python in the wild? Are large constrictor snakes such as Burmese pythons able to kill people? What is the risk? Would this be in the wild, or in backyards? Can invasive pythons be eradicated? Could invasive pythons move into cities? Boa constrictors and northern African pythons live in or adjacent to the Miami metropolitan area, and in their native ranges various python species and the boa constrictor are often found living in suburban and urban areas. As with alligators, the risk of human attack in urban areas is very low but not absent. 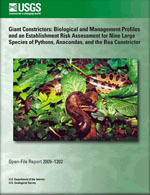 Reed, Robert N.; Walters, Katie D.
Reed, Robert N.; Rodda, Gordon H.
Giant Constrictors: Biological and Management Profiles and an Establishment Risk Assessment for Nine Large Species of Pythons, Anacondas, and the Boa Constrictor; 2009; OFR; 2009-1202; Reed, Robert N.; Rodda, Gordon H.
In 2003, wildlife scientists carrying out regular nighttime road surveys in Everglades National Park started to see fewer medium-sized mammals. Over the next few years, rabbits disappeared completely, and populations of foxes, raccoons, possums, bobcats, and white-tailed deer were either small or absent. EVERGLADES NATIONAL PARK, Fla.— The largest and longest Burmese Python tracking study of its kind -- here or in its native range -- is providing researchers and resource managers new information that may help target control efforts of this invasive snake, according to a new study led by the U.S. Geological Survey. The estimated tens of thousands of Burmese pythons now populating the Everglades present a low risk to people in the park, according to a new assessment byU.S. Geological Survey and National Park Service scientists. HOMESTEAD, Fla. -- Precipitous declines in formerly common mammals in Everglades National Park have been linked to the presence of invasive Burmese pythons, according to a study published today in the Proceedings of the National Academy of Sciences. 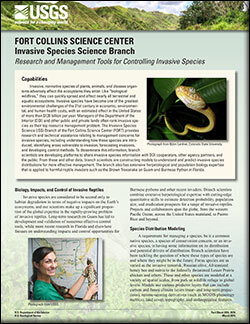 New research published today has identified challenges in using computer models to predict the potential of pythons or other invasive vertebrate species to spread across portions of the United States, according to the U.S. Geological Survey. Five giant non-native snake species would pose high risks to the health of ecosystems in the United States should they become established here, according to a U.S. Geological Survey (USGS) report released today. 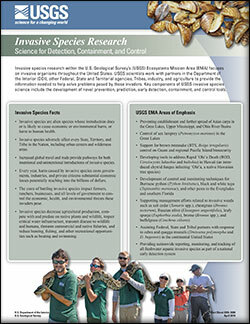 The USGS report details the risks of nine non-native boa, anaconda and python species that are invasive or potentially invasive in the United States. USGS intern Jillian Josimovich displays a recently captured Burmese python, an invasive species in Everglades National Park. Photo credit: Alejandro Grajal-Puche. A Burmese python coiled in the grass in the Everglades. A Burmese python stretched out in the grass in the Everglades. An 18 inch python found in north Key Largo, August 23, 2016 photo by Jeremy Dixon, USFWS. Ladies of the Glades hold a very large Burmese python.